Wow, this was quite a week, wasn’t it? i love my weekends, so much more time for stamping and creating… I prepared a couple fun cards for my team get together tonight, here they are, what do you think? I wanted to feature new products, so we are using the new circle and label thin lists to be able to make these cute “swing” cards, it’s so easy! The little leaf file folder card I learned how to make while watching a you tube video from another demonstrator named Patty Bennett. Wouldn’t this be a great card for a secretary or co-worker? 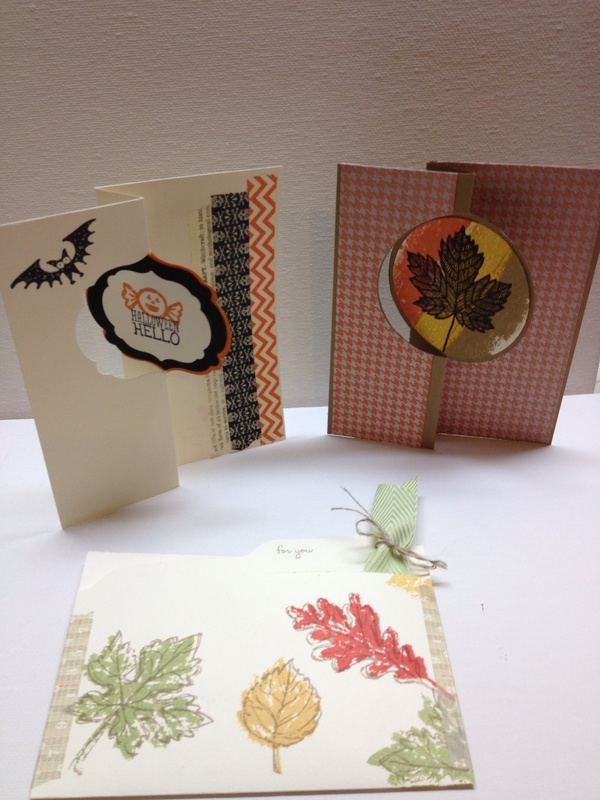 It was so easy with our new envelope punch board and stamping trimmer. Spoiler alert, the little Halloween card featured here is also a card my club girls will make too (in addition to the fall banner I showed you he other day). Did you see my post yesterday about the clearance rack new additions? Well, I saw online that some items are already sold out, so if you had your eye on something get it quick, and don’t forget to use my hostess code to get the lower price and to be entered to win my monthly on,one drawing. Well, thanks for reading. Have a great Friday!